St Etheldreda’s, Ely Place, is one of the oldest and most beautiful chapels in London, built towards the end of the 13th century by John de Kirkby, Bishop of Ely. In 1874, Father W. Lockhart bought the chapel at auction on behalf of the Rosminian Fathers of the Institute of Charity, a religious congregation founded in Italy in 1828 by Antonio Rosmini. The Rosminians restored the building, adding new stained glass to the east and nave windows some of which was made by Christopher Whall, then a lay brother with the order. Twice bombed during the Second World War, the roof and much of the east end was destroyed. During the 1950s, a new east window was commissioned from Edward Joseph (Eddy) Nuttgens. Later, his pupil and friend Charles Blakeman created stained glass for the nave, west window and crypt. The east window (1952) is generally regarded as Nuttgens’ finest work, one of the few in which he ‘let his imagination take command and soar’. On a bright day, the space above the altar seems to shimmer with the vibration of red and gold against blue and green stained glass. Even on the dullest days of a London winter, the window gives the worshipper or visitor the overwhelming sense of being in a powerful and sacred space. Nuttgens has placed Christ the King in the centre of the window surrounded by angelic figures in red robes with bright red halos above curiously pale purple faces. Their expressions are fierce, almost implacable, and their gold wings serve to link Christ’s figure with the four outer windows. Eight figures fill these, ranged roughly in two tiers. Matthew, Mark, Luke and John occupy the upper row, each holding a scroll containing the first words of his own Gospel written in Latin. On either side of Christ and apparently in conversation with him stand Mary and Joseph (holding a lily staff). Beyond Mary stands St Etheldreda against a green ground holding a model of the monastery she founded at Ely. Above her, Nuttgens has placed a small deathbed scene showing the fidelity of her followers. St Bridget stands opposite. Her scene shows the laying of the foundation stone of her chapel in the wood. Each saint wears the robes of her order and holds her staff of office. Below the two female saints, Nuttgens has placed the coat of arms of the Rosminian Order and the Pelican, symbol of charity. 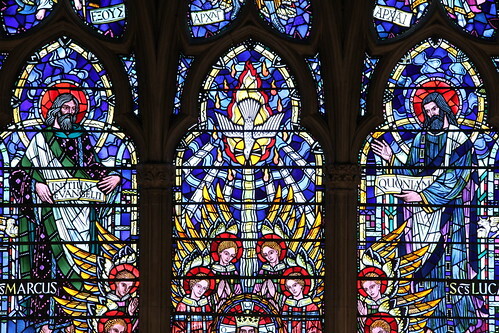 In the upper part of the window the largest traceries contain some of the nine orders of angels and the smaller ones various symbols – Alpha, Omega and Chi Rho. At the point of the arch and completing the Trinity, God the Father looks down. His eyes have been outlined with strips of lead to make them clearly visible from below. Patrick Reyntiens, Nuttgens’ studio assistant at this time, painted some of the glass in this part of the window. At the base of three of the windows, Nuttgens has placed a sturdy version of the Last Supper mostly in bright golds and reds whose clearly articulated composition surely reveals the influence of his friend and neighbour, Eric Gill. Everywhere the eye rests there is pleasure. The border and background have been filled with interlocking patterns linking the figures to the architecture. Nuttgens’ son Patrick recalled ‘the excitement in the studio as unusual combinations of form and colour were tried out, discarded or modified’. The dramatic nave windows were made by Charles Blakeman (b.1907) between 1953 and 1956, their colour chosen to harmonise with Nuttgens’ east window. A sequence of Old Testament scenes fills those on the south side with New Testament scenes on the north. At once serious and lively, the scenes possess the spontaneous vividness of a painter at ease with his art. Blakeman has presented each story with liveliness and clarity and there is an intimacy in the presentation of these well-known events that is most attractive. Less happy, perhaps, is the sense of compression caused by the patterned background in a sharper blue than the tones of the east window. Between these windows stand the austere and moving figures of English Catholics put to death for their faith during the reigns of King Henry Vlll and Queen Elizabeth, sculpted by Charles’ wife, May Blakeman. In 1964, Blakeman added a west window with a similar subject – Catholic suffering during the Reformation. Here three Carthusian monks who together with two other priests were put to death for refusing to acknowledge Henry Vlll as head of the Church have been shown in the centre of the window, while Christ triumphant hangs on the Cross above the Tyburn Gallows. On the right, episodes from Christ’s Passion echo parallel scenes of the suffering of the Martyrs for their faith. The arms of the donors have been placed at the base. The window has considerable impact. 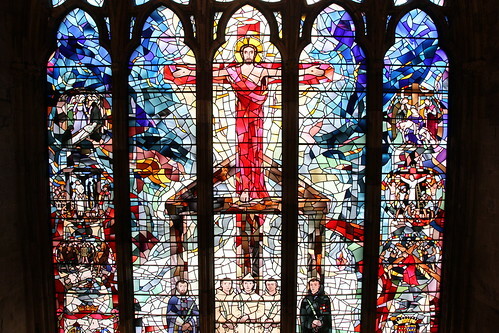 On leaving the chapel, congregation and visitors alike face the five martyrs, while the wide-spread arms of Christ, against a crimson crucifix, stretch out above. Eddy Nuttgens (1892–1982) was born in Aachen. His father was a tailor’s cutter who, with his English wife, eventually settled in Harrow where Nuttgens grew up, attending the local Catholic Primary School and then life-drawing classes at Harrow School of Art. While working in a sandblasting factory at Grays Inn Road, he met Arthur Orr, a designer for the firm of Hardman’s who had moved to London to start his own stained glass business. Nuttgens worked for five years as his assistant, attending the Central School for classes taught by Karl Parsons. Nuttgens then joined Lowndes and Drury’s Glass House in Fulham, assisting both Parsons and Margaret Rope with cutting and painting. In this way he learnt to translate other artists’ designs into glass, an ability that provided him with a steady income when personal commissions were scarce. Many of Herbert Hendrie’s windows, for example, were made by Nuttgens. Through making a window for Robert Anning Bell, Nuttgens was asked to start a stained glass department at the Royal College of Art after the First World War, a war that he had spent interned in Scotland as an enemy alien (being German born). The British Legion (tipped off by E. Liddell Armitage) then discovered his presence at the Royal College and demanded his removal. Thus he returned to fulltime glassmaking and Martin Travers took over at the Royal College. Between the wars, Nuttgens moved away from London, working with the stained glass artist, Paul Woodroffe in Chipping Campden. Woodroffe was a Slade trained illustrator and one of the first artists to learn the craft of stained glass with Christopher Whall. A devout Catholic, he set up his own studio in the Cotswolds where he made many fine windows, mostly for his own church community. Nuttgens must have found this a congenial place in which to live and work. He helped Woodroffe make windows, taught the 14-year old Charles Blakeman the craft of stained glass and fell in love with the children’s tutor. They subsequently married and together set up house, first at North Dean then at Piggotts Hill. Although Charles Blakeman continued to make stained glass windows, he had many other skills. He was an accomplished landscape painter and stone carver who, like Nuttgens, was greatly influenced by Eric Gill’s clarity of design. He moved to London during the 1960s and then to Brailles in Warwickshire, retiring from window making in the 1980s. Piggotts Hill remained Nuttgens’ home and studio for the rest of his life. Here he and his second wife raised their children and here he made his own and other artists’ windows with a few assistants. Looking back, his son, Joseph Nuttgens, remembered ‘the glass, the lead, the kiln, the sound of glass cutting, the glazing, the fixing of windows into ancient churches with their crumbling masonry … a succession of still, tall saints appearing for a few weeks one after the other and then disappearing suddenly, rolled and stored in some dusty attic … the squeak of charcoal on paper, the mouse-like scratching into glass paint that would continue for days on end, punctuated by the occasional ‘damn!’ … I found the studio a remote and, with its grey-green walls and black doors, gloomy place’. I know there were times when (my father) resented having to lie in the bed he had made himself. ‘Oh, to be a simple farmer’, he would say.